Disclosure: Special thanks to the wonderfully nice folks at Pigeon Forge Convention and Vistor’s Bureau and Eagle’s Ridge Resort for generously hosting us during our stay! I recently had a chance to go back to Tennesssee to meet up with my buddies, Stacey from Southern Bite and Christy from Southern Plate. We’ve all known each other for years but we live in separate states so we don’t get to see each other as often as we’d like. So, we figured Tennessee was a good halfway point for all of us. And we all LOVE Pigeon Forge. 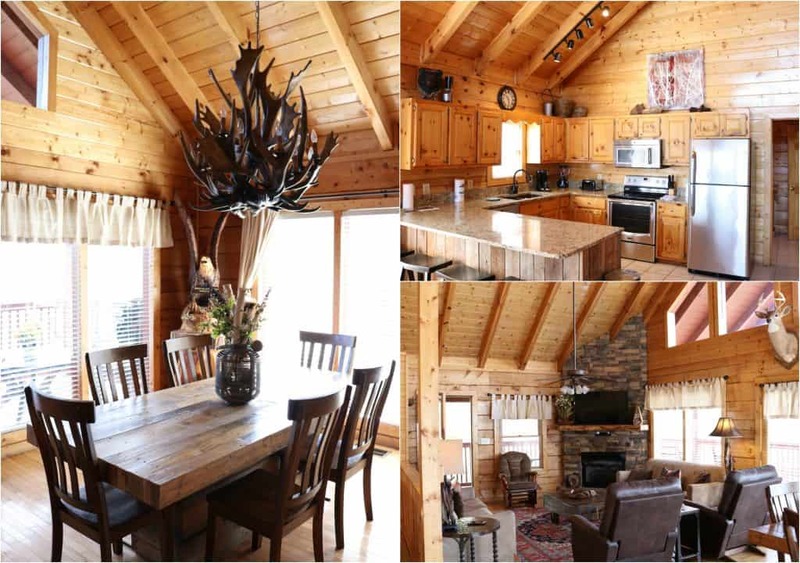 There’s a lot to do, great places to eat and gorgeous, home-y cabins. We only had a couple of days but we packed a lot in! 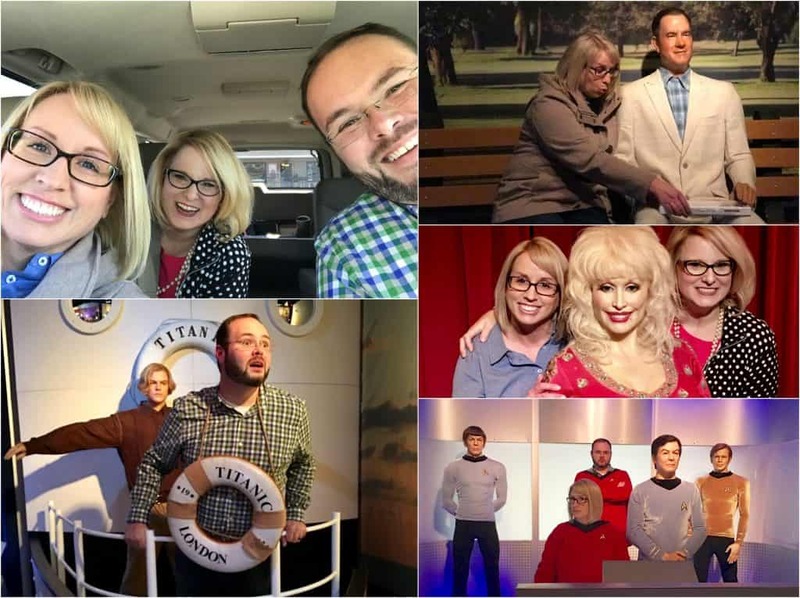 We had way too much fun at the Hollywood Wax Museum. We ate a delicious meal at the Local Goat (y’all, I cannot recommend the deep fried deviled eggs enough!) 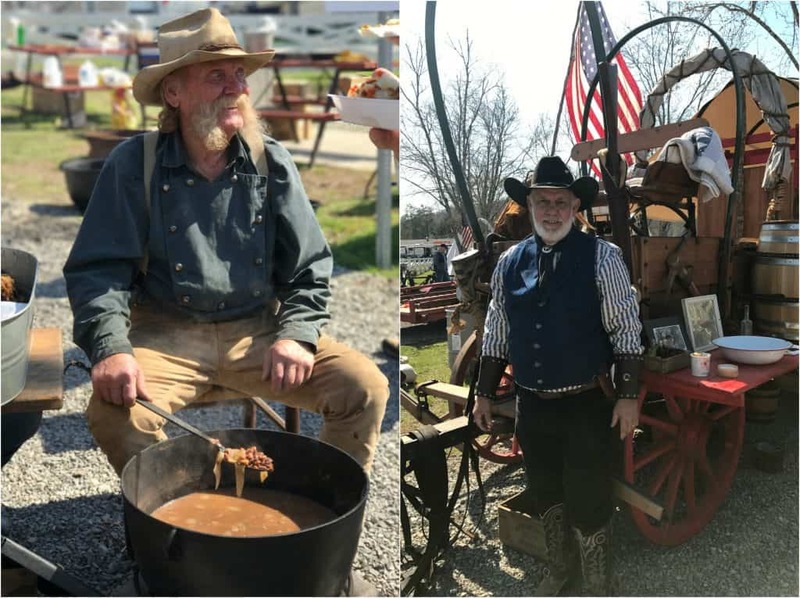 We also had a chance to go to the Chuckwagon Cookoff that was held the same weekend we were there. These are some amazing cooks and they were SO friendly. I can’t stop gushing about them enough. Kind folks who let me crawl all over their chuckwagons and take pictures. They even let me eat some of the delicious food they were cooking up! 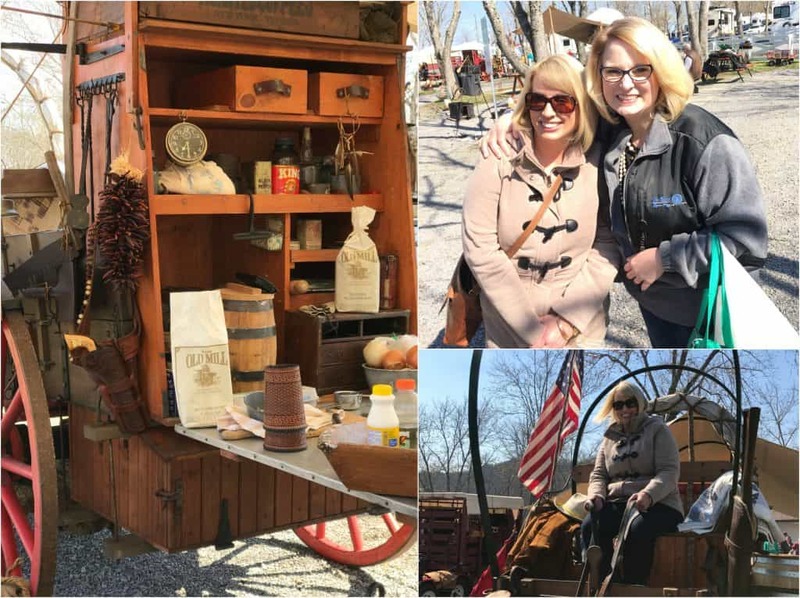 If you ever get a chance to come to Pigeon Forge during this Chuckwagon Cookoff – you gotta go! You won’t regret it. I have never meet nicer people in my life! Thanks to everyone’s suggestions on where to eat. I only wish we would’ve had more time! 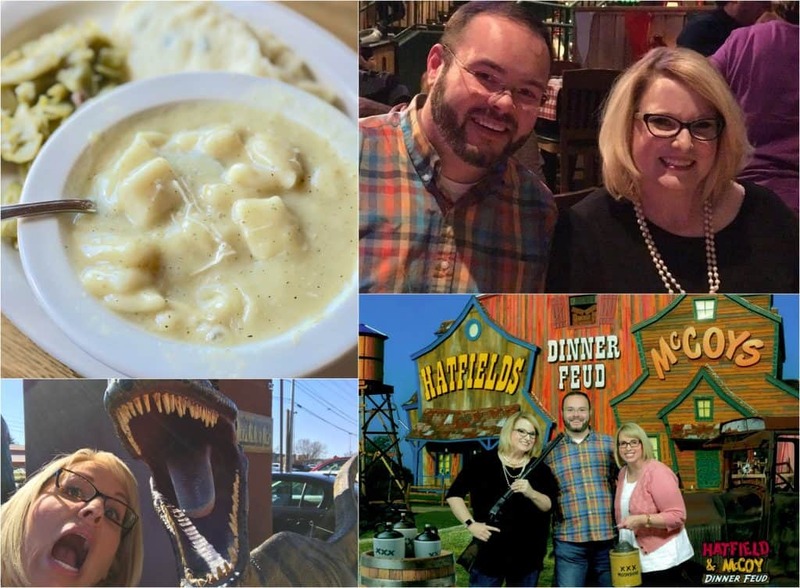 We, of course, ate at the Old Mill Restaurant and I had the most delicious chicken and dumplings. Christy booked us a reservation at the Hatfields & McCoys Dinner show. It was ridiculously fun. And they served some of the best fried chicken I have had in a long time. I was totally impressed. 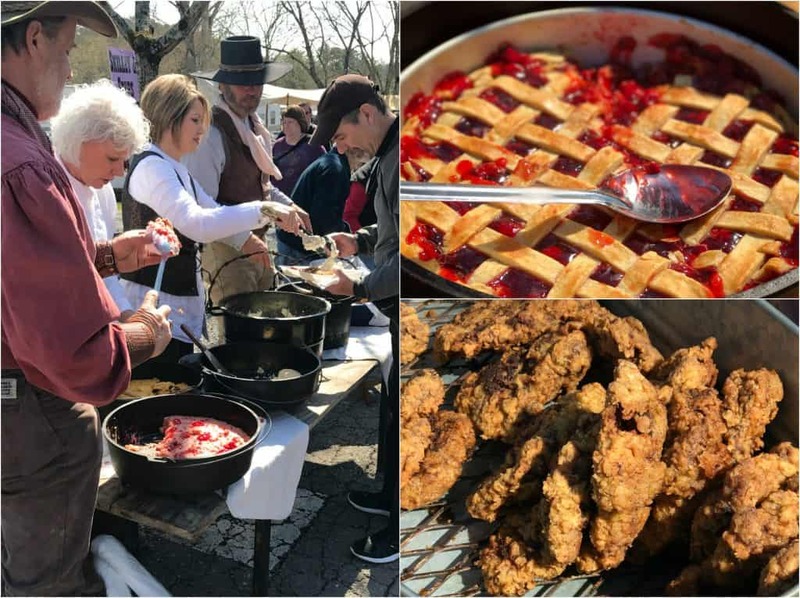 It’s a family-friendly show and you can’t beat the good food! 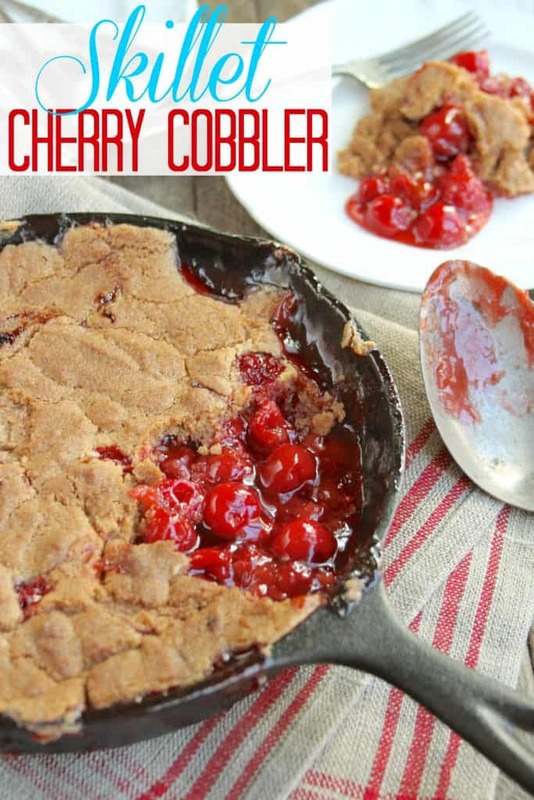 Now for this cherry cobbler recipe! 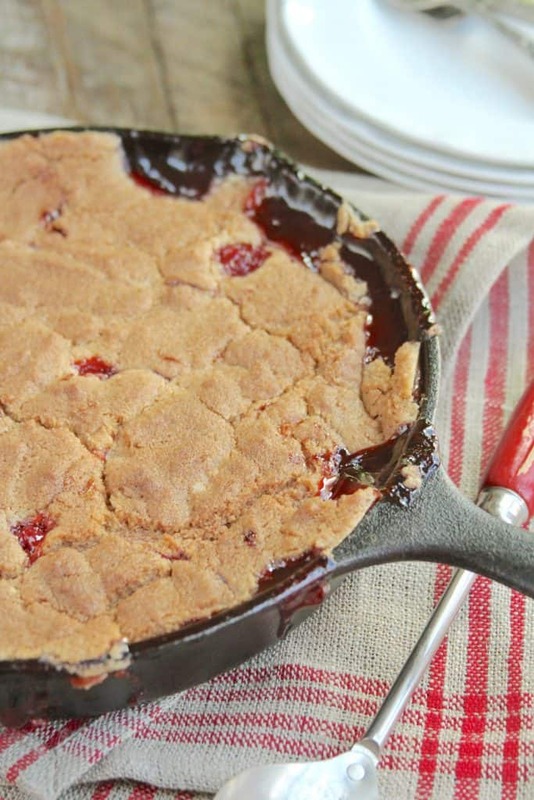 It was inspired by all the yummy looking cobblers we saw at the Chuckwagon Cookoff! This is Stacey’s Mom’s recipe for it. Simple but oh so good! Preheat the oven to 350° F. Lightly grease a 10-inch cast iron skillet. Pour the cans of pie filling into the bottom of the skillet. In a medium bowl, stir together the cake mix, melted butter, and cinnamon. Drop the batter by dollops on top of the filling. Bake for 50 to 60 minutes or until the batter is set. Serve warm. 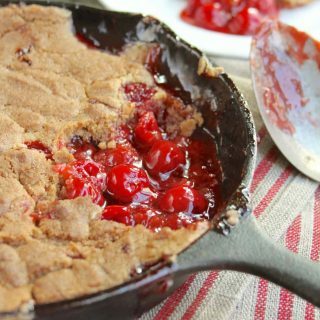 Skillet Cherry Cobbler is a super easy but super yummy cobbler recipe. 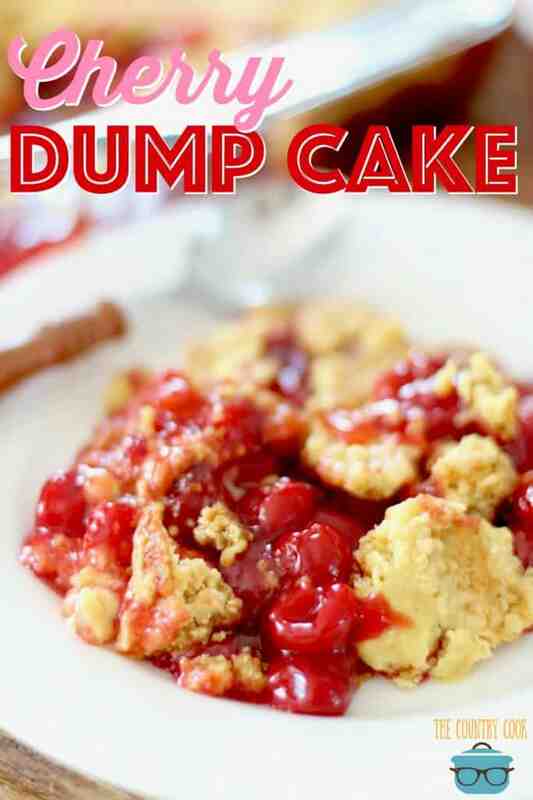 Made with cherry pie filling and Jiffy yellow cake mix. Lightly grease an 10-inch cast iron skillet. Pour the cans of pie filling into the bottom of the skillet. In a medium bowl, stir together the cake mix, melted butter, and cinnamon. Drop the batter by dollops on top of the filling. Bake for 50 to 60 minutes or until the batter is set. Serve warm. 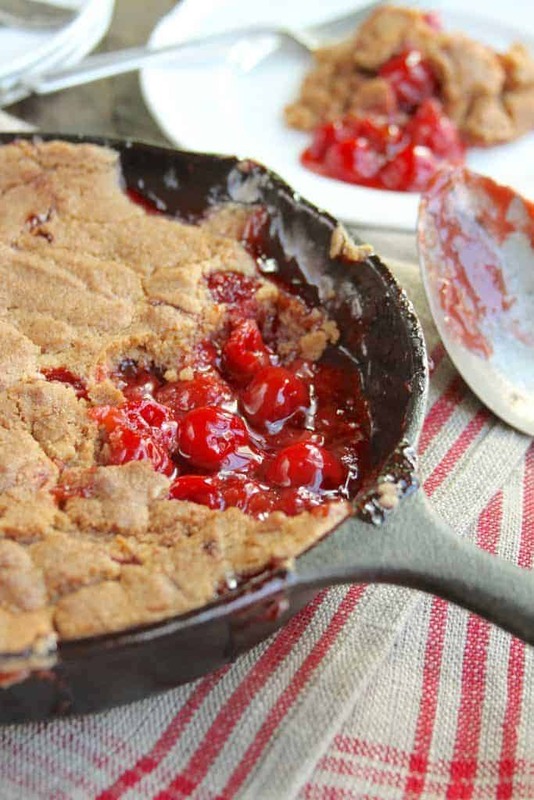 I think I would like to try this with either apple or blueberry instead of the cherry. All of this would work great! 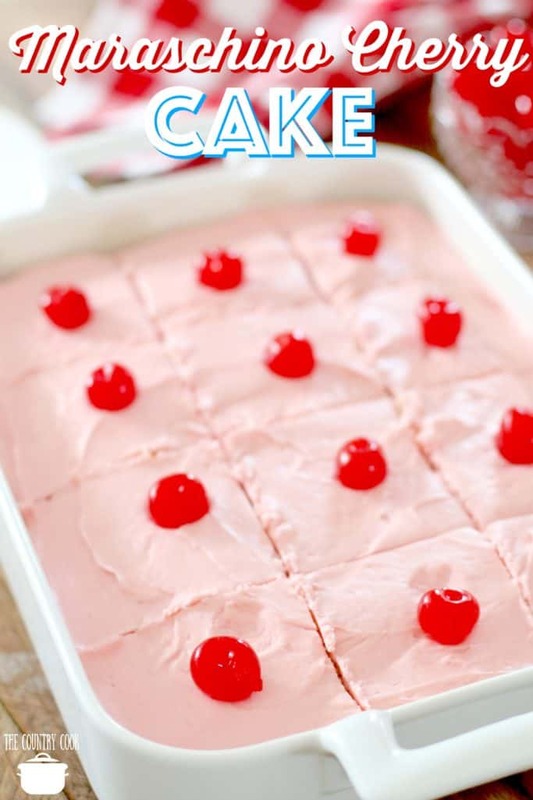 Can you use a bigger box cake mix if you use spice cake this sounds delish , I’m makeing the cherry for me I would like to try the apple? I died laughing watching your video with the other bloogers. You all are hilarious! I just want to add my two cents with people I hate the most who post. I changed every single thing in your recipe and it tasted like sh*t. So I am giving it zero stars. Hi Linda! Ha! Glad we could make you laugh! And yes about the changing of the ingredients. I never mind an honest review but I don’t think we can give honest reviews if the recipe and directions weren’t followed exactly. Right? Loved the video!! So hilarious. Thanks for all you do- especially causing diabetes and posting food that looks like Bleep!!! You all are a blessing and remind me of why I’m a proud southern!! Would it come out just as good in any 10inch skillet? Or does a cast iron make it taste better. Tried this recipe last night and it was delicious!! Yes!! Thanks for coming back to let me know LaShawna!! Try adding a cup or so of fresh or frozen whole cranberries. You won’t be able to taste the cranberries but they will make taste like it was made with fresh sour cherries. A cousin taught me this trick with cherry pie a while ago and I couldn’t believe how much it tastes like fresh cherries. Barb – what a fantastic idea! I never thought of that! What a great tip!!! Well I just love all three if Y’all!!!! I enjoy saving all the recipes. Your blogs bring such pleasure each day I don’t know what is wrong with people!! If they are southern they will enjoy them too. If they are not then……who cares!!!! My Momma taught me that being a southern lady has some rules and one of them is … if you don’t have anything nice to say about someone, then keep your mouth shut!! Folks that is just plain good manners. Darn skippy! Love it Yecedrah – thanks SO much!!! I love this recipe! It’s versatile, too! Spice cake with peaches! I’m making the cherry one 1st and will use the frozen cranberry hint! I had to buy a cast iron skillet! I can’t wait! Thank you for the recipe!